The library supports different color variations. If color makes no matter, developer can use a default value. Otherwise, color can be specified with the definite value or with a function. 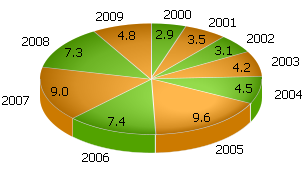 In this case all chart elements have one color. The method is more appropriate for Bar Charts than for Pie Charts. 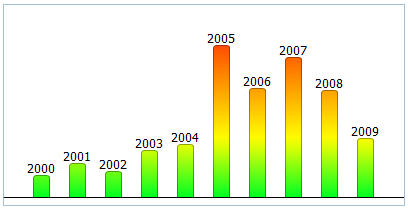 Bar charts allow defining color gradient for bars. It can be done using a function that takes a gradient object as an argument. color - a string representing a CSS color.